Finding the right chemistry between players has never been a problem for Michigan head coach Red Berenson. This season, he's continued to find two players that mesh well in defense partners Chris Summers (left) and Brandon Burlon (right). Summers is a junior captain and Burlon is a freshman, but playing beyond his year for the Wolverines. Berenson said he likes what he has seen, especially last weekend, out of his NHL-caliber combo coming from each side of the border. "They're getting a lot of confidence, and certainly Summers is our anchor on defense, and now playing with this young freshman is bringing him along," said Berenson. "I thought for the most part they were effective offensively (last weekend), and they're giving us a defense that we can have a lot confidence in." Both Summers, a Milan native, and Burlon, from Nobleton, Ont., are being watched by the NHL as Summers was a first-round pick of Phoenix back in 2006, while Burlon went in the second round last June to New Jersey. Summers has nothing but praise for Burlon and added on to what Berenson said regarding his overall improvement. "I think we play well together," Summers noted. "We have been practicing for the past couple of months together and I think the most important thing is the line of communication between Burlon and me. That is really apparent during the game. We practice it in practice and we try to talk to (goalie) Bryan Hogan and the centers and make sure everyone knows where they need to go. We will play off each other. Burlon is a little bit more offensive and likes to handle the puck and I like to skate a little bit more. So it is good we are playing very well right now." Burlon heaped the kind words right back on Summers. "He has done a great job in taking me under his wing and showing me the ins and outs and what I am doing wrong and also complementing me when I am doing things right," Burlon said. "I look up to a guy like him. He has come in as a junior and assumed the role of captain and is doing a great job. Hopefully, we will stay together and keep improving throughout the year." 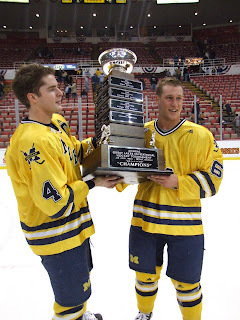 With a 15-7-0 overall record heading into this weekend and a top-10 national ranking, much of the Wolverines' success can be attributed to Michigan's perfect blend on the blue line.